S. Max Edelson, Plantation Enterprise in Colonial South Carolina. Cambridge, MA: Harvard University Press, 2006. European settlers came to South Carolina in 1670 determined to possess an abundant wilderness. Over the course of a century, they settled highly adaptive rice and indigo plantations across a vast coastal plain. Forcing slaves to turn swampy wastelands into productive fields and to channel surging waters into elaborate irrigation systems, planters initiated a stunning economic transformation. The result, Edelson reveals, was two interdependent plantation worlds. A rough rice frontier became a place of unremitting field labor. With the profits, planters made Charleston and its hinterland into a refined, diversified place to live. From urban townhouses and rural retreats, they ran multiple-plantation enterprises, looking to England for affirmation as agriculturists, gentlemen, and stakeholders in Britain’s American empire. 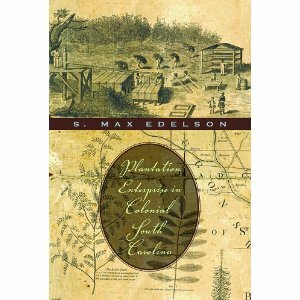 Offering a new vision of the Old South that was far from static, Edelson reveals the plantations of early South Carolina to have been dynamic instruments behind an expansive process of colonization. With a bold interdisciplinary approach, Plantation Enterprise reconstructs the environmental, economic, and cultural changes that made the Carolina Lowcountry one of the most prosperous and repressive regions in the Atlantic world.